Archipelago of San Andrés, Providencia and Santa Catalina (Spanish: Archipiélago de San Andrés, Providencia y Santa Catalina), or colloquially San Andrés y Providencia, is one of the departments of Colombia. It consists of two island groups about 775 km (482 mi) northwest of mainland Colombia, and eight outlying banks and reefs. The largest island of the archipelago is called San Andrés and its capital is San Andrés. The name is sometimes abbreviated to "Archip. de San Andres". The official website abbreviates it as San Andrés ("Gobernación de San Andrés"). ISO 3166-2:CO lists it as "San Andrés, Providencia y Santa Catalina". Statoids lists it as "San Andrés y Providencia". Spain formally claimed the archipelago of San Andres and Providencia in 1510, a few years after the Discovery of America by Christopher Colombus. In 1544 the territory was placed under the administration of the Captaincy General of Guatemala. During the early years, Spain concentrated on exploring and colonizing the mainland, and the islands were hardly settled. In 1630, English Puritans arrived in Providence Island, under the aegis of the Providence Island Company. 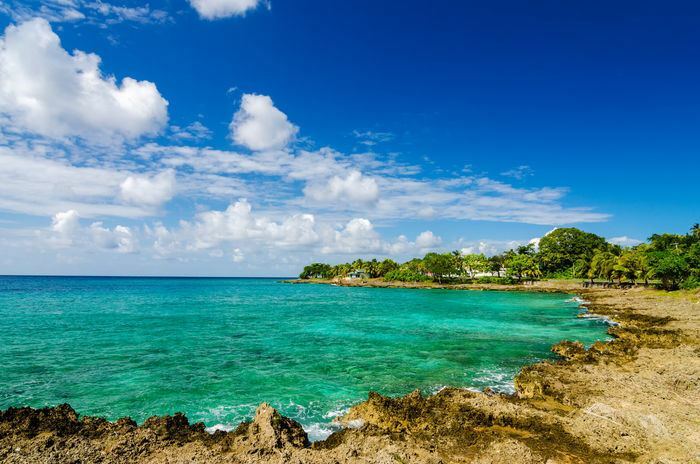 These Puritans decided to settle this promising tropical island rather than cold, rocky New England, but the Providence Island colony did not succeed in the same way as the Massachusetts Bay Colony. They established slave-worked plantations and engaged in privateering, which led to the capture of the colony by Spain in 1641, who had claimed it a century earlier. In the 1640s, the Puritan-controlled Commonwealth government of England tried to regain the island, but without success. In 1670, English buccaneers led by Henry Morgan took over the islands, which they are connected to the British Mosquito Coast in present-day Nicaragua. The buccaneers and other pirates controlled the islands until 1689. Later Spain regained control of the archipelago, which it held until the independence of Colombia in 1822. In 1775, a Spanish lieutenant of Irish descent called Tomás O'Neil, was given military command of the islands and in 1790 named governor. He requested transferring the islands to the jurisdiction of the Viceroyalty of New Granada which was granted in 1803. That year Spain assigned the islands together with the province of Veraguas (western Panama and the east coast of Nicaragua) to the Viceroyalty of New Granada. 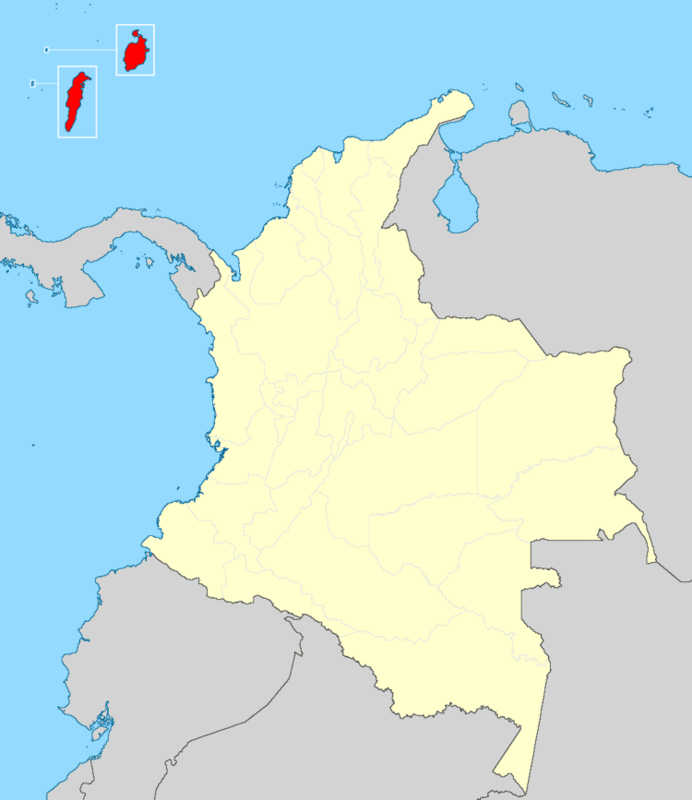 The territory was administered from the province of Cartagena. Soon, trade links with Cartagena were greater than those with Guatemala. On July 4, 1818, French Corsair Louis-Michel Aury, flying the Argentine flag, captured Old Providence and St. Catherine islands with the help of 400 men and 14 ships. The island was populated by white English-speaking Protestants and their slaves. Aury and his team used the islands as their new base from which to pursue Central American independence. However, his efforts to also support Bolivar in his fight for Venezuelan and Colombian independence were repeatedly turned down. In 2001 Nicaragua filed claims with the International Court of Justice (ICJ) over the disputed maritime boundary, claiming 50,000 km2 (19,305 sq mi) in the Caribbean, including the San Andrés and Providencia archipelagoes. Colombia responded that the ICJ has no jurisdiction over the matter, and increased its naval and police presence in the islands. Colombia also defended its claim in the ICJ. On December 13, 2007 the ICJ ruled that the islands were Colombian territory, but left the maritime border dispute unresolved. Colombia and Nicaragua will go through another trial to resolve these claims. On November 19, 2012, the International Court of Justice decided that Colombia had sovereignty over the islands. The island of Providencia was hit by Hurricane Beta on October 29, 2005, inflicting minor to moderate damage. In the 19th century, the U.S. claimed several uninhabited locations in the area under the Guano Island Act, including several now claimed by Colombia. In 1981, the U.S. ceded its claims to Serrana Bank and Roncador Bank to Colombia and abandoned its claim to Quita Sueño Bank. The United States still maintains claims over Serranilla Bank and Bajo Nuevo Bank and considers them both to be unincorporated territories of the United States. In 1903 the local Raizal population rejected an offer from the USA to separate from Colombia in the wake of Panama's secession from Colombia. However, the native population of the Island soon changed their minds when the policies of successive Colombian governments tried consistently to modify the majority Raizal and British ethnic composition of the Islands through extensive migration of Spanish-speaking mainland Colombians. To add fuel to the fire, the assimilation and immigration efforts were led largely by Catholic missionaries, which did not go well, considering that the native population was Protestant. A member of the departmental assembly for 15 years, Pedro Gallardo Forbes, of the Regional Integration Movement (MIR), won the governor election at the October 28, 2007 election, with support from the Colombian Conservative Party and the Radical Change party. He succeeds a governor from the Colombian Liberal Party. He got 8,187 votes (38.93%), Aury Guerrero Bowie (Liberal Party, with support from the Democratic Colombia Party) 8,160 votes (38.8%) and Jack Housni Jaller (Social National Unity Party) 4,063 votes (19.3%). Only 21,991 out of 41,197 potential electors voted in the gubernatorial election. At the departmental assembly, elected the same day, the 9 seats were distributed among 6 parties: 3 Liberals (Arlington Howard, Qwincy Bowie Gordon and Leroy Carol Bent Archbold), 2 MIR (Jorge Méndez and Freddy Herazo) 2 Democratic Colombia Party (former MP María Teresa Uribe Bent and former Interior Secretary Rafael Gómez Redondo), 2 SNUP (Fernando Cañon Florez and María Said Darwich), 1 Radical Change (Heber Esquivel Benitez) and 1 Conservative (Julio César Gallardo Martínez). This is the main island of the San Andrés group, and the largest of the Departament. It is located at 12°33′N 81°43′W. It measures 12 km in length with a width of 3 km and covers an area of 26 km². There is a tiny lagoon in the centre of the island called Big Pond. The principal town is San Andrés in the north of the island. Another town is San Luis on the east coast. Cayo Johnny (Johnny Caye) lies 1.5 km ENE of German Point (Punta Norte), the island's northern tip, and Haynes Cay about the same distance east of the island. Cotton Cay is less than 1 km south of San Andrés town, on the northeastern coast. This atoll is southwest of San Andrés at 12°10′N 81°51′W. It is the westernmost point of Colombia. The reef is about 7 km across. In the southern part are Cayo del Norte and Cayo del Sur. Cayo del Norte, the larger of the two, is up to 2 m high and overgrown with palm trees and bushes. Cayo del Sur, a few hundred metres further South, reaches a height of a little more than 1 m and is vegetated with a few bushes, and in the South with mangroves. There is a lighthouse on Cayo del Norte, at 12°10′N 81°50′W, operating since 1980. It is maintained by the Colombian Navy. This atoll is 22 km east-south-east of San Andrés Island and 35 km northeast of Cayos de Alburquerque, at 12°24′N 81°28′W. It is 14 km long and 4 km wide. There are a few sand cays in the southeast. The largest ones are Cayo del Este, Cayo Bolivar, West Cay, and Cayo Arena, none of which are higher than 2 metres. All cays are overgrown with palm trees and bushes, and surrounded by mangroves. There is a Colombian Navy lighthouse on Cayo Bolivar. The cays are regularly visited by fishermen from the Colombian mainland and San Andrés. There are two concrete buildings on Cayo Bolivar, and a few wooden huts on the other cays. The Departamento de San Andrés, Providencia y Santa Catalina covers a land area of 44 km2 and had a Census population of 59,573. The latest official estimate for 2007 is 72,923. The airport serves the towns of San Andrés and San Luis, but also commercially serves the nearby island of Providencia Island, all being major tourist and vacation spots for South and Central American tourists. Gustavo Rojas Pinilla International Airport is also known as Sesquicentenario International Airport. The airport is the 6th busiest airport in Colombia in terms of passengers, with 836,234 in 2006. Most of these passengers come from the continental part of the country, due to poor international direct service to the island. Many international tourists have to fly to one of Colombia's or Panama's largest airports (Bogotá, Medellín, Cali, Cartagena, Panama City) to be able to reach the islands. Although in recent years San Andrés has started to receive seasonal charter flights, mainly from Canada and a few Central American countries.